The way American painter Caio Fonseca speaks is important. His voice is earnest and syncopated. He pronounces his T's clearly and crisply, even at the ends of words. Though he is American, his intonation is vaguely European. 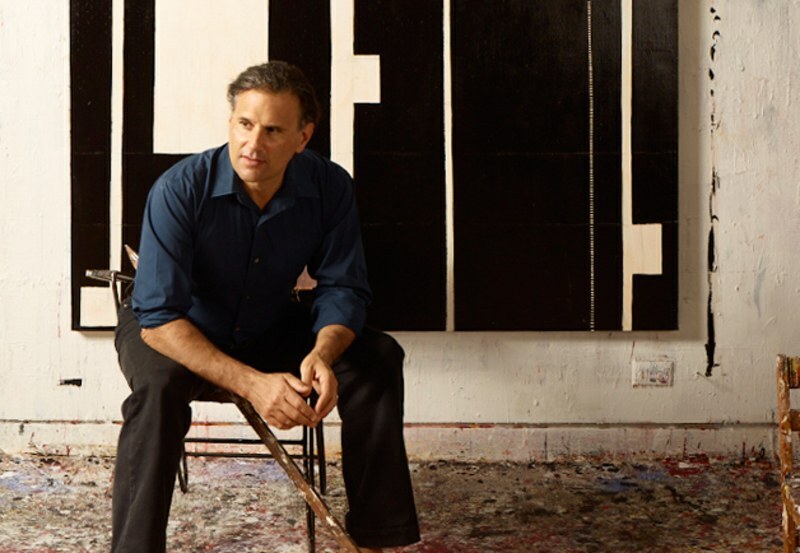 And for good reason—after dropping out of Brown, he studied painting in Spain, Italy, France, and elsewhere for 15 years before returning to New York in 1993 and selling paintings to the Metropolitan Museum at his very first show that same year. Following Fonseca's exhibition at the Kasmin Gallery in New York, GQ Deputy Editor and fellow painter Michael Hainey sat down with Fonseca to discuss the new direction of his work, as well as the influence of music on his art, his relationship with his sculptor father, and the importance of loneliness. GQ: This obviously is a leap here. How did that happen? Caio Fonseca: I'm still trying to understand how. I actually got out of bed at four in the morning one night and painted the first one. I think that I had explored every possible corner of the tonal world of painting—it's almost like the history of music, where every aspect of tonality had been explored. There's a famous quote ascribed to Arnold Schoenberg. Some student of his said, "Are you Arnold Schoenberg?" and he said, "Somebody had to be!" Meaning that he was a great tonal composer, but he realized the implication after Mahler and Bruckner—he himself composed in the older styles, but it had to come almost resentfully. He had to change. I don't feel any resentment, but I do look at the work and not immediately recognize them as me me. It had the feeling of both trying to learn a new language and speak it at the same time. The strange thing is that I did five or six of these paintings last spring, and I had excellent beginner's luck. I went to Italy, where I normally get such great results, and I made every necessary mistake, in a way. Technically these paintings were very different. In the past I needed the paint to stay wet for 10 hours, which is a lot to ask of New York—un-interruption for 10 hours—whereas the place I have in Italy, the phone doesn't ring. Every year for 25 years I've had about five months of pure studio time in Italy. I realized that I was actually quite dependent on that double life, of separating my New York life from my pure studio time. There's something about having month after month after month without interruption that allows you to exceed what you're capable of in a place like New York. I think these paintings take so long because every little detail affects the whole. It's constantly adding and subtracting, adding and subtracting. I don't think you decide a painting is done; I think you discover it's done when you can no longer add or subtract. You have to have ruined a number of paintings to know that that's a good time to stop. It's funny, when I play a piece by Bach for someone, no one ever said, "Oh, that's beautiful, but what does it mean?" It's strange, because they should be saying that. What does it mean? It's completely abstract. But culturally, or as humans, we accept that kind of music for what it is, though there could be nothing more abstract. So I live and breathe that kind of abstraction, where the meaning is one that is revealed in the language of paint, not in the text on the wall, per se. But I might be getting too specific. That was one answer to one question. GQ: [Laughs] No, not at all. You do use a little bit of the language of music when you talk about the new series of paintings and how it's much more structure and scale versus tone. CF: It's difficult to describe, but I have had recourse to certain musical terms for these paintings. I know how to paint them now and it took a long time to get this sort of grammar down. I've been playing piano my whole life, but I've only been studying composition for about three years. And it's the damndest hobby to have—it's like launching a canoe into the Pacific, it's such a big undertaking. But it's been so exciting. It's as if you've loved looking at paintings your whole life but never painted one. You don't automatically understand what they're made out of. You think that Beethoven descended from the gods, but it's a learnable thing. That doesn't mean you're going to be Beethoven, but it's not just genius. I can now produce mediocre classical music, which is amazing. It's like someone who was afraid of water can now surf, really badly. It's an amazing transformation. I'm not trying to be a professional, but I'm pretty serious about it. I want to keep understanding more and more.